Novelist James Baldwin is one of the authors featured in the Schatten Gallery's new exhibit "WRITERS." A reception celebrating the 18 guest curators of the exhibition will be held in the gallery, so visitors can mingle with the curators and view the photographs and materials. Wine and light refreshments will be served. Free and open to the public. Parking is available in the Fishburne deck. Poet Anne Sexton pauses with a half-smoked cigarette dangling from her hand. 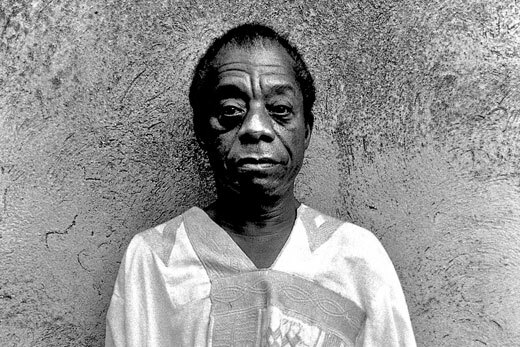 Novelist James Baldwin stands before a stone wall, his elaborately embroidered robe framed by the starkness around him. These arresting images are part of the new exhibition, "WRITERS," opening Friday, March 30 at Emory University's Schatten Gallery in the Robert W. Woodruff Library. The exhibition features photographs of a variety of writers — poets, authors, playwrights, journalists and others — taken by acclaimed photographer Nancy Crampton, and juxtaposes them with related materials from Emory's Manuscript, Archives, and Rare Book Library (MARBL). It will remain on view through Nov. 2, 2012. Crampton, known for her ability to capture the essence of her subject in her pictures, has served as the official photographer of the Unterberg Poetry Center in New York City for more than 20 years. Her portraits have been featured on hundreds of book jackets and in numerous magazine articles. While her photographs have been displayed previously at other galleries, the 50 images in this exhibition were chosen for their potential to demonstrate connections to materials in MARBL and to reveal networks of writers that cross boundaries of place and genre. "WRITERS" includes photographs of such diverse literary icons as Salman Rushdie, Truman Capote, Toni Morrison, Seamus Heaney, Gwendolyn Brooks, Jorge Luis Borges, Gloria Steinem, Tennessee Williams and Margaret Atwood. "When you look at each of the writers individually, their contributions are impressive. However, when you collect all of these writers into one room it is even more exciting to discover the different ways they are connected to one another," says Julie Delliquanti, director of the Schatten Gallery and associate curator of library exhibitions. The exhibition also reminds viewers of the accessibility of MARBL's rich resources. Many of the portraits are accompanied by rare and unique materials culled from MARBL's collections, such as a 1985 letter from Eudora Welty to Emory professor Floyd Watkins and a manuscript draft of the commencement address Ralph Ellison gave at the Curtis Institute of Music in 1975. A range of individuals of varying ages, levels of experience and fields of interest were selected to guest curate the exhibition. "We chose people from across the university and the community," says Elizabeth Chase, MARBL coordinator for research services. "We wanted to draw in multiple voices and show the range of ways that different groups of people use MARBL's materials." Among the 18 guest curators are Rosemary Magee, vice president and secretary of Emory; Sally Wolff King, author and adjunct professor of English at Emory; Daren Wang, executive director of the AJC Decatur Book Festival; Emory faculty, graduate students, undergraduates, alumni and staff; and two students from the advanced placement literature course at Druid Hills High School. After selecting authors whose work sparked their curiosity, the guest curators conducted research in MARBL's collections. They selected items from the collections that inspired them to create narratives that blend a personal and scholarly approach to archival investigation. A typescript draft of Natasha Trethewey's upcoming work, "Thrall." A reception is being planned for mid to late April; check the Robert W. Woodruff Library homepage for updates.